To create a payment form to allow customers to sign up for recurring plans, go directly to the Subscriptions Options tab. By default, subscription plans are disabled (turned off). If subscriptions are enabled by selecting one of the other two subscription options, the one-time payment option previously selected (first tab) will be ignored. If you haven’t done so already, you’ll need to have subscription plans set up in your Stripe account. See Adding Subscription Products & Plans in Stripe. The only exception is if you set up a single plan custom amount form (custom amount plans are generated automatically). 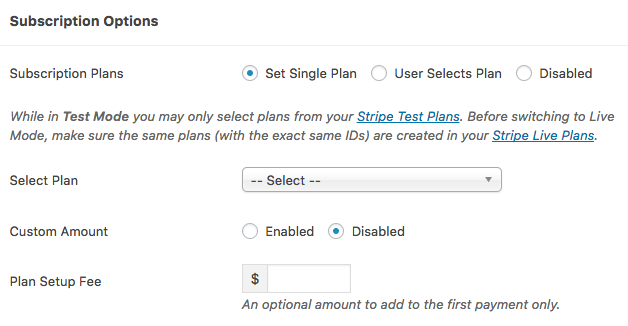 While in Test Mode you may only select plans from your Stripe Test Plans. Before switching to Live Mode, make sure the same plans (with the exact same Plan Nicknames) are created in your Stripe Live Plans. Plans with a trial period are supported as well. To see many of the subscription payment form options in action check out the subscriptions demos. Need to set up installment plans (aka “max charges”)? See details here. To create a payment form where the customer can sign up for one plan and one plan only, select Set Single Plan. To connect the payment form to an existing Stripe plan, select a plan from the dropdown. Alternatively, you can enable a recurring Custom Amount. Be sure to set a minimum amount, default amount and the interval/frequency of the recurring charge. Finally, you can specify a Setup Fee to be added to the first payment only. To create a payment form where the customer can sign up for one of several available plans (and optionally set a custom amount), select User Selects Plan at the top. Next, select the Display Style. Currently, the choices are a radio button list or a dropdown. Buttons as selections are coming in a future update. Next, one a time you can add and select the plans that the customer will be presented with. They can be dragged and deleted as needed as well as a default option set. You can override the text displayed for each plan with a Custom Label value. If these are left blank, the plan names, amounts and interval/frequency set in Stripe will be displayed (i.e. “Silver Plan $25.00/month”). An added Setup Fee for the first payment only can be specified for individual plans (inputs on the right) or set for all plans (separate input underneath). Just like the “Set Single Plan” option, “User Selects Plan” allows for enabling a recurring Custom Amount option. If enabled, a custom amount option and field will be presented to the customer in addition to the other plans. Be sure to set a minimum amount, the interval/frequency of the recurring charge and a label for the custom amount input.